Picture this: You’re perched at a bar, bathed in soft moodlighting. A bar tender furiously shakes a cocktail and you sip on a glass of fine champagne, contemplating the tempting spread of canapes in front of you. Guests around you mingle and chatter, and a live stream sports game plays on the big screen. 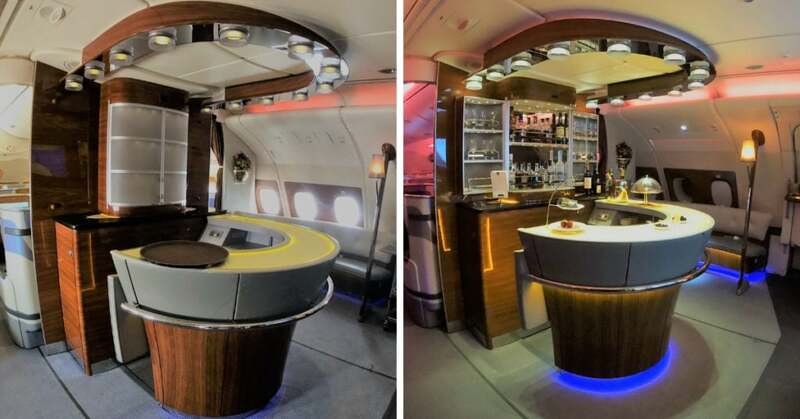 While you could be at a high end local watering hole, you’re actually on the upper deck of the Emirates A380 – flying at 40,000 feet. The iconic Emirates 380 cocktail bar and lounge is a popular area for travellers to perch at during their journey. As a self confessed AV geek, it’s one of my personal favourite aviation experiences (coming only second to the Emirates first class shower spa). Curious about what to expect from a visit the Emirates A380 bar, or keen to find out how you can score entry to this ultra-exclusive space? Read on to find out everything you need to know. 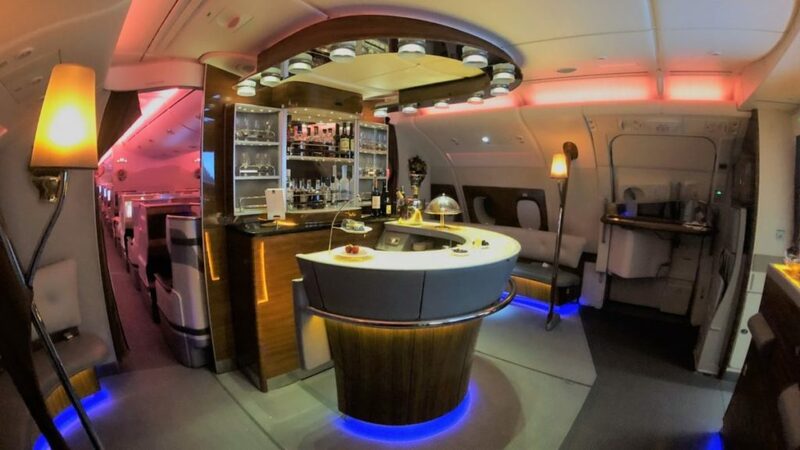 When can passengers access the Emirates A380 cocktail bar? The bar and lounge area is accessible from the moment that the seat belt sign has been switched off, until preparation for landing. Unlike other airline lounges (the rather lacklustre Qantas first and business class lounge coming to mind), the Emirates A380 bar is fully tended for the duration of your flight. After take off, a great deal of effort goes into transforming the space into an inviting and welcoming area. From applying soft mood lighting and setting out a tempting array of canapes, to displaying a spirits line up that your local bar would envy, the busy crew get to work as soon as the seat belt sign is switched off. 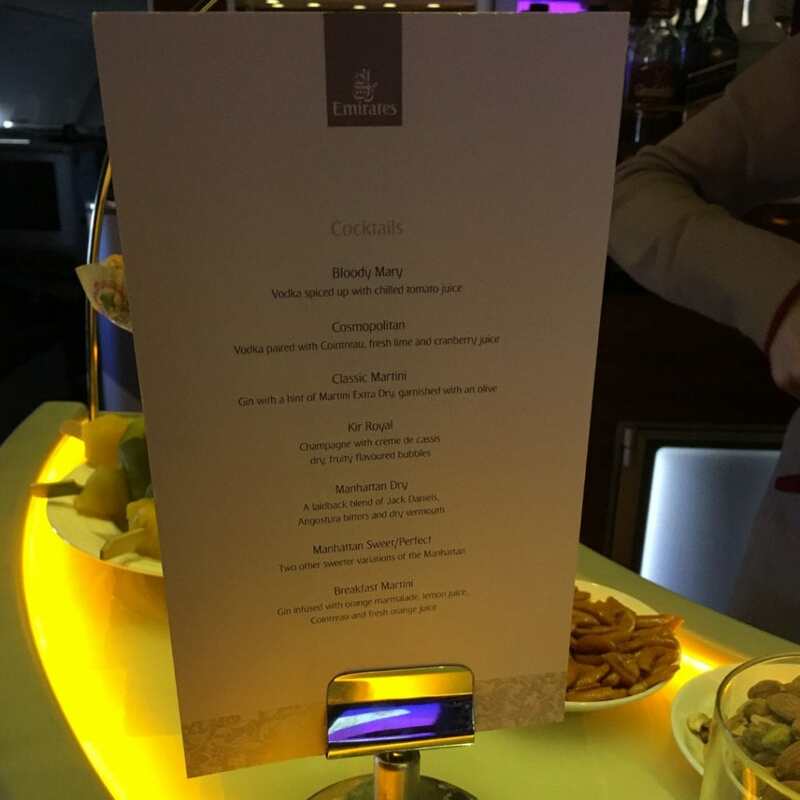 So just who gets access to the Emirates A380 bar? 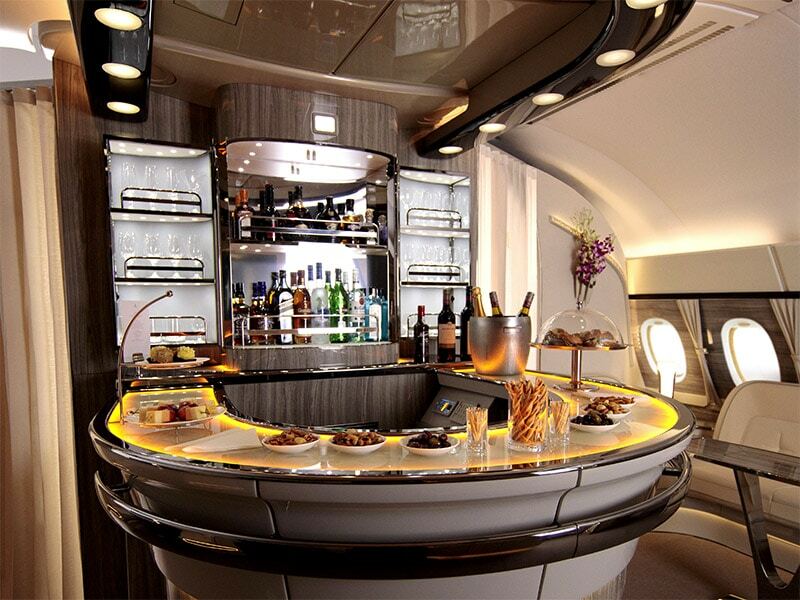 The Emirates A380 bar is accessible to all Emirates first class and business class passengers. As expected, economy passengers aren’t granted a pass, and there is no premium economy currently offered on Emirates A380 aircraft. 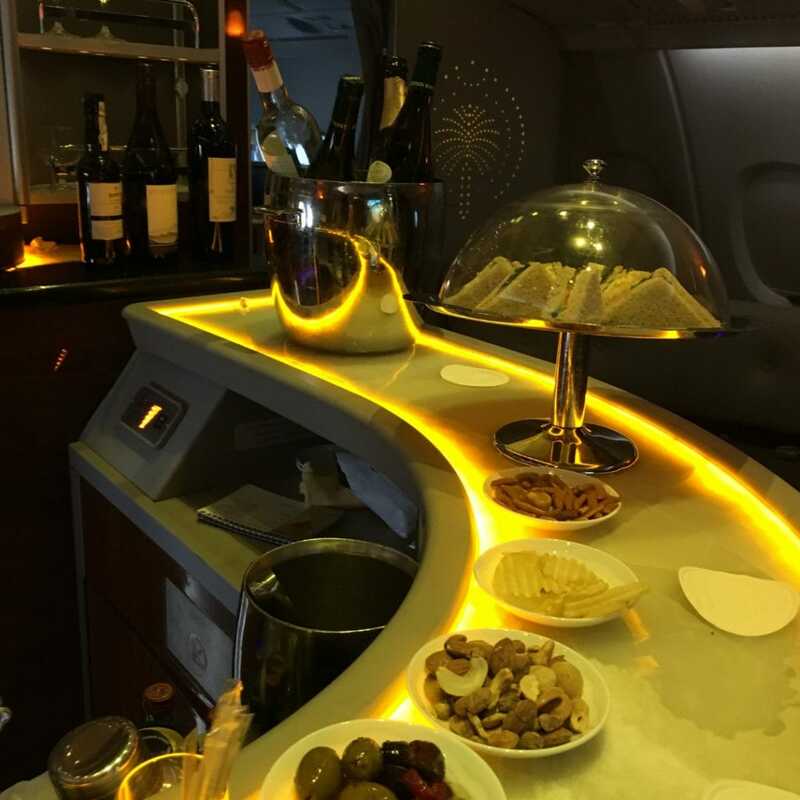 Australian or New Zealand based travellers looking to experience the Emirates A380 bar at low cost might consider booking a leg on the Emirates A380 Sydney – Christchurch service. At the time of writing, it’s the last remaining trans-Tasman service operated by Emirates. And at just 36,000 Qantas points one way (plus taxes) for a business class ticket, it’s a very accessible flight redemption opportunity for members of the Qantas Frequent Flyer scheme. Where is the Emirates A380 bar and lounge area located? The Emirates A380 bar is situated at the rear of the upper deck, immediately behind business class. It’s something of a trek from the Emirates first class cabin, which is located right at the front of the A380 upper deck. However, first class passengers keen for some inflight exercise will likely appreciate the opportunity to stretch their legs. Moseying down to the bar and lounge area during your flight, you can either perch to stand at the central cocktail bar, or at one of several bar height tables or shelves. You’ll find seating areas on both sides of the bar (complete with seat belts, which you’ll need to fasten if unexpected turbulence hits). These can be handy for making use of the Emirates inflight WiFi during your visit. A large TV screen and refreshment shelf is located at the back of the bar. 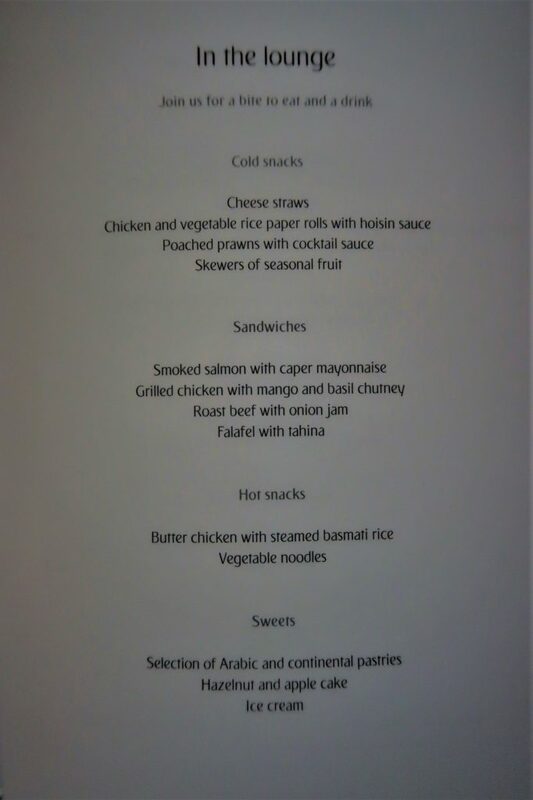 The Emirates A380 bar offers an array of bar snacks and bite size finger foods to tide travellers over until their next in-seat meal. Items such as cheese sticks, chips and olives, petite sandwiches, wraps and sweets are all temptingly arranged on display platters. You’ll also generally find a menu perched at the bar. On offer are several more substantial hot snacks. These can either be served to you in the bar and lounge area, or in the comfort of your own seat. Fancy a cocktail? Your friendly bartender will happily mix you up something from the inflight cocktail list. From the old school glamour of a Kir Royale, to an on-point Classic Martini, you’ll find a range of short and long drinks on offer. A selection of top shelf spirits are available, too. At the time of writing, you’ll see Sipsmith London Dry Gin, Belvedere Vodka, Woodford Reserve bourbon and the ever-popular Hennessy XO. Travelling in Emirates business class? You’ll be able to enjoy free-flow Champagne, as served to the wider cabin. The drop on offer is generally Moet Chandon NV, although Veuve Cliquot NV occasionally makes an appearance. 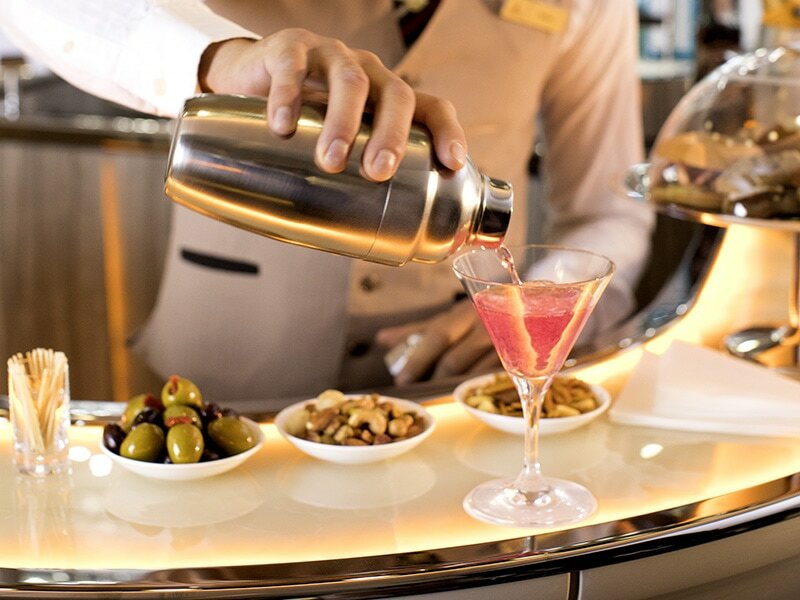 Do Emirates first class passengers score better drinks? If you’re an Emirates First Class passenger, there’s no need to forego your vintage Dom Perignon Champagne or Hennessy Paradis. 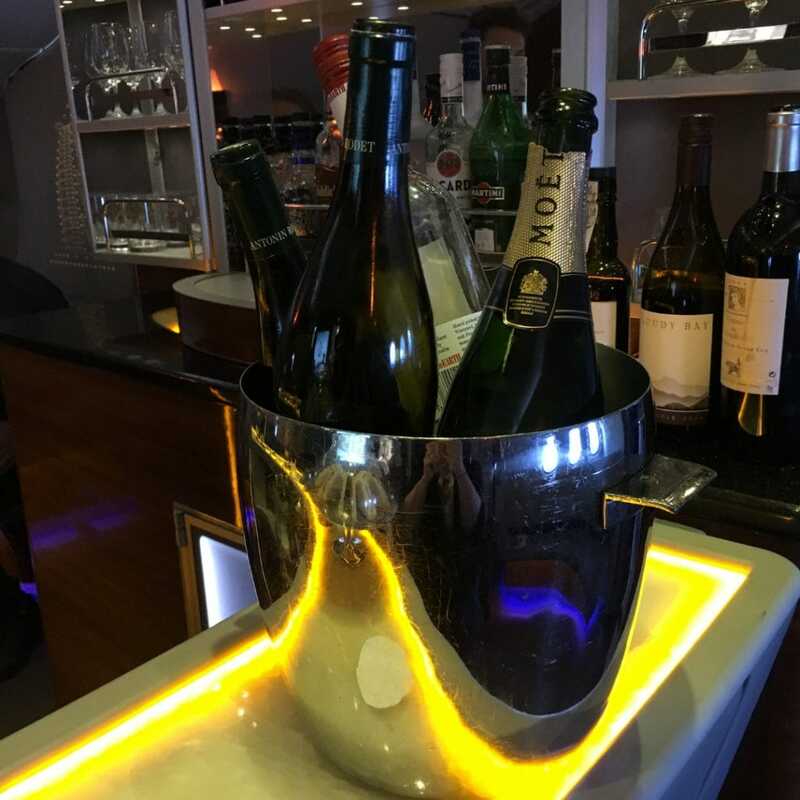 Simply let a crew member know that you’re heading back to the business class bar, and they’ll discreetly ferry through your high-end tipple of choice so that it can be served to you exclusively. Are there different variations of the Emirates A380 bar and lounge? In July 2017, Emirates started rolling out a new design for their A380 bar and lounge area. With the rollout still in progress, you may be lucky enough to experience it on your next flight. The revamped inflight bar features more sociable seating arrangements, larger areas for mingling and calming LED mood lighting.